Atheloptic means something that involves eyes (optics) - in this case reduction or total loss of eyes. 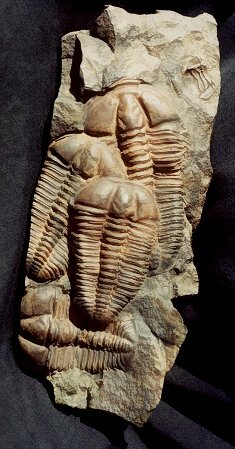 By the way, Sam has a very informative page on trilobite eyes here. As for no eyes - I have heard about olms (Proteus anguinus) that are amphibians living in dark caves and have no eyes. So this phenomenon is familiar to us also from the nature of modern Europe. So it is relatively easy to understand when Sam writes "secondary reduction and loss of eyes is thought to be a trend among benthic species living in deep, poorly-lit or aphotic habitats". Organisms living in this zone are called benthos. They generally live in close relationship with the substrate bottom; many such organisms are permanently attached to the bottom. The superficial layer of the soil lining the given body of water, the benthic boundary layer, is an integral part of the benthic zone, as it greatly influences the biological activity which takes place there. Examples of contact soil layers include sand bottoms, rocky outcrops, coral, and bay mud. Over here you do not need eyes so drop them! Nature does not waist on complex things that are not needed. Sam: "It is interesting to note that another trend of deep bottom habitat adaptation is an increase in the number and width of thoracic segments, which might be related to specialized feeding adaptations."